Three main geographic zones are used to refer to the relative amount of sunlight reaching the surface of Earth. The tropical zone is used for the area between 30 degrees North to 30 degrees South. It is a large band straddling the equator and comprises the largest surface area of the three zones. It is also the area that gets the most sun and thus is the warmest (in general), often with little seasonal change. The temperate zone is the area between 30 degrees and 60 degrees both North and South. Thus, there are two temperate zones. As far as temperature goes, the temperate zone is in the middle, with warmer summers and cooler winters. The polar zones are found between 60 degrees and 90 degrees North and South. There are two separated polar zones (just like the two temperate zones) - one surrounding the North Pole and one surrounding the South Pole. These areas get the least amount of sun on planet Earth and are the coldest. Most continental land masses are in the northern hemisphere of Earth whereas the southern hemisphere is dominated by the marine environment. The seven continents of Earth are large land masses with a similar geological history. Most 'seas' are around the edges of oceans and are partially surrounded by land. These 'seas' are really part of the ocean. There are a few exceptions to this, most notably is the Sargasso Sea (1). The use of the term 'sea' is also used as a synonym with ocean as well as for an area of the ocean where there are many types of wind waves forming a mixed up surface. Surrounding the Atlantic ocean is the Weddell Sea (2), the Caribbean Sea (3), the North Sea (4), and the Mediterranean Sea (5). Surrounding the Pacific Ocean is the Ross Sea (6), the Coral Sea (7), the South China Sea (8), the Sea of Japan (9), the Sea of Okhotsk (10), the Bering Sea (11), and the Sea of Cortez (12) (also called the Gulf of California). Surrounding the Indian Ocean is the Red Sea (13), the Arabian Sea (14), and the Bay of Bengal (15). Surrounding the Arctic Ocean is the Bering Sea (11), the Laptev Sea (16), the Barents Sea (17), and the Beaufort Sea (18). An island is a body of land surrounded by water. This body of land can be quite large or quite small but is considered to be smaller than a continent. The several islands that are commonly used to illustrate marine science concepts are shown here. They are the Hawaiian Islands (1), the Galapagos Islands (2) and the Aleutian Islands (3) in the Pacific Ocean; Greenland (4), Iceland (5) and the United Kingdom (6) in the Atlantic Ocean; and Madagascar (7) in the Indian Ocean. Some people consider the continent of Australia (8) to be an island as well because it is surrounded by water - it is both a continent and an island. 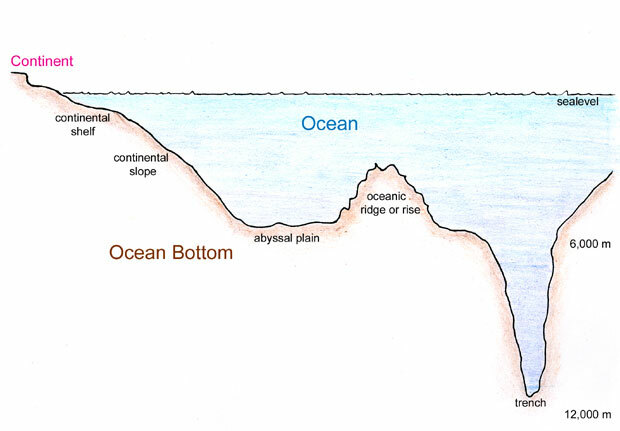 Five main distinctions are used to describe the ocean bottom over most of Earth. These vary with each ocean but in general there is a continental shelf along the edge of each continent, this is followed by a continental slope that leads down to the deep-sea floor. The width of the continental shelf and its continental slope vary greatly between the continents. The deep-sea floor is called the abyssal plain which is rather flat and covers about 50% of the seafloor. In most oceans there is an underwater mountain range called an oceanic ridge (or rise) that is part of one great meandering sea floor feature on Earth. This mountain range comes up from the abyssal plain and covers some 30% of the sea floor. Finally, there are deep folds in the sea floor called trenches. The trenches cover only about two percent of the sea floor and are the deepest parts of our oceans.